Bright early morning sun woke me, though I lounged in sleeping bag luxury for a while, trying to determine how sick I really was (pretty bad actually). Of course there was little choice, I had to hike out somewhere, so I continued on my path. Stopping at the hut to get water and eat a granola bar, I spoke with one of the expedition guides who remarked about how early I was leaving–it was seven o’clock, those hut folks are the ones luxuriating. Leaving first was a lagniappe as I had the tundra all to myself most of the morning. 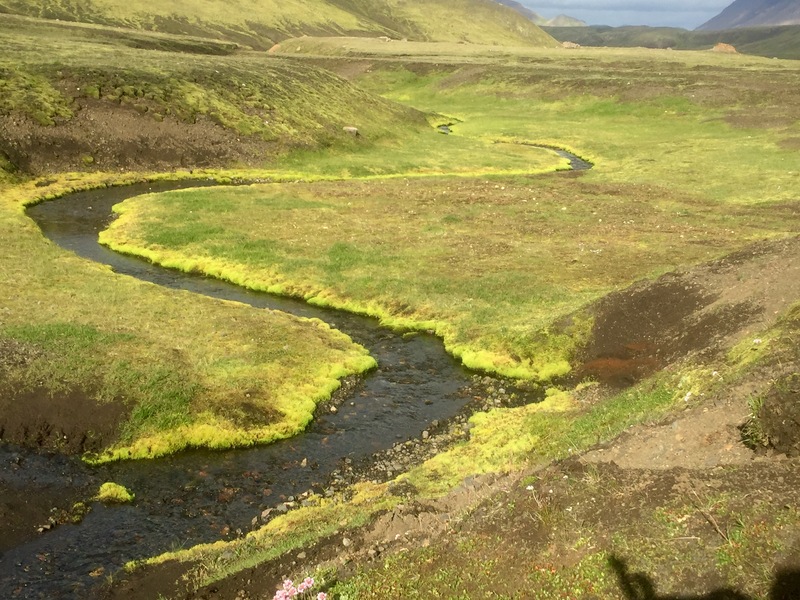 The walk was across a broad cinder plain rutted by deep cuts formed by glacier streams. For much of the year, those cuts are filled with snow, so walking is fairly level, but in August most the ice is gone, so there is a lot of up and down. In many places there remains some snow, but the guidebooks all warn about the fragility of those ice bridges which are hollowed from below and can give way under the weight of a hiker crossing. As it was still very cold that morning and there were no trekkers following behind me as yet, I crossed many an ice bridge gingerly. Still, the morning solitude was magnificent, the world was vast, bare, and empty. By mid-morning I arrived at the campground at Lake Álftavatn, stopping for second breakfast. I had gotten an email from David Knobbe, my old friend at the Georgia Tech outdoor adventure department, detailing the itinerary of a group of students from my school who were hiking at nearly the same time. At this point I was supposed to be two days behind and so I didn’t expect to see them, but on sitting down for late morning granola, I was greeted by David, his friend Chaffee and a group of GT students. Their itinerary had been adjusted a bit, so half of them were now on the same schedule as me. After exchanging pleasantries, I continued on to the next campground, Botnar, where I was advised to claim a tent site quickly as the place would soon be overwhelmed by campers, led by the dozens of British hikers I had passed who were walking to raise money for breast cancer research. One carried on her back a large rubber breast with the url copafeel.org. Following the same pattern as yesterday, I set up my tent, ate an early dinner, and dozed away the late afternoon. I was pleased with my hiking distance, but was still feeling ill, so early sleep was on my schedule. Up early for walk to the bus station and a four hour ride to the trail head of the Laugatvegur Trek. The landscape was unsurprisingly similar to parts of New Zealand’s North Island, both the product of recent volcanic activity. The American and Eurasian plates are tearing the island apart at a rate of 5 centimeters per year, so there are many earthquakes, hot springs in everyone’s back yards (it is how they heat), and regular eruptions blanketing the landscape with lava rocks and fine dark sand. In the uplands the primary plants are mosses. Trees are small and scarce. Arrival at Landmannalauger quickly disabused me of the notion this would be like hiking New Zealand unless it were the Tongariro crossing where the crowds tend to overwhelm the experience. Landmannalauger was a tent city full of trekkers preparing for the trail or relaxing in the hot volcanic pools after completion. As it was already noon and I had at least 12 km over Mount Brennisteinalda before camping, I headed straight out. Still suffering from the effects of illness, I hoped to leave the circus behind. 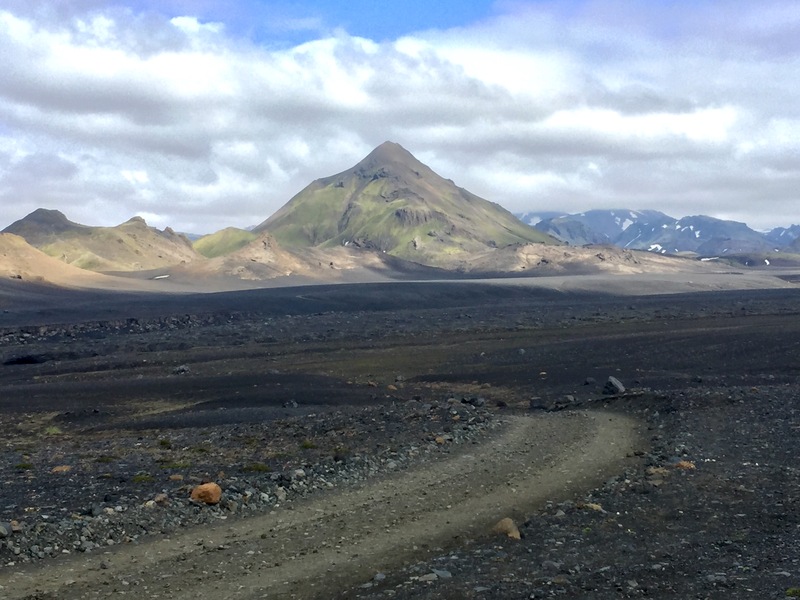 The path was full of Laugavegur trampers but also day hikers and families up to see Brennisteinalda, the island’s most colorful mountain. 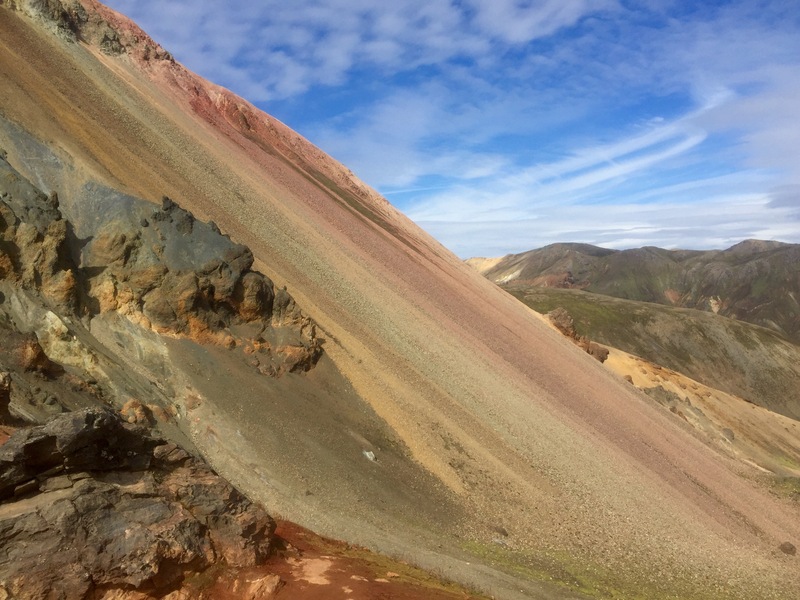 It was jaw-dropping, on one flank were slides of different colored gravels forming a rainbow pattern. I had purchased a low-resolution topo map at the information center which I completely misread and, like a rookie trekker, after summiting I followed a path off the back side of the mountain to the valley floor only to discover I was heading in exactly the wrong direction, so I had to climb it again–a really rusty long-distance hiker. It is hard to write of the landscape as it was unlike any I’ve ever seen–color, texture, pattern–and luckily the light was perfect. Some fields were covered with broken rocks that looked like obsidian, black glass shining in the Arctic sun. After my initial mistake, the trail was easy to follow, packed as it was like the Camino de Santiago. 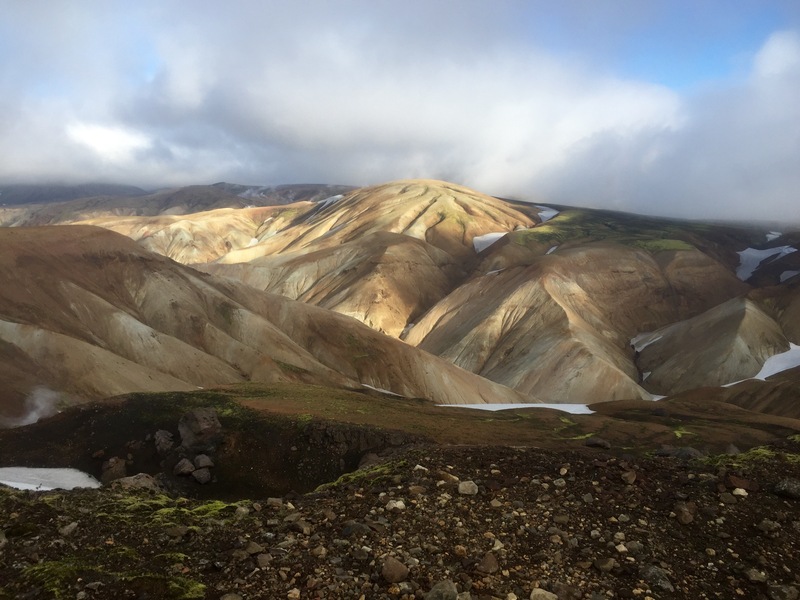 Before long I found myself at Hrafntinnusker, a campsite the trekkers call the windy place. The tent sites were surrounded by low stacked stone circles to help cut the wind. There are huts with tent sites every 12-15 km along the trail where expedition companies do a thriving business ferrying luggage and cooking food for wealthy slack-packers. Life down in the tent sites was a little more spartan. Since it was a fairly short trek and you cannot fly with fuel and since I had shipped my Jetboil home, I opted for cold food– trail mix, chorizo, and crackers. By late afternoon my tent was up, half a chorizo was eaten, and I found myself napping in my sleeping bag out of the cold wind. Soon the circles filled up and, lucky me, I found myself next to some loud Americans. I still don’t understand the need for so much volume, often seems like children begging for attention. There was no waiting for dark as it stays light very late (and gets light very early), so I soon drifted off, listening to the light ticking of minute raindrops on my tent. Lying there I was reminded how much I enjoyed the simple pleasure good equipment offers. A good Zpack tent and a great sleeping bag were the definition of real comfort putting in stark contrast the last six weeks in an apartment with a big bed, bathroom, kitchen, etc. It is amazing how soft you can get in such a short time living like that.